The Call of Duty® app provides a new mobile experience designed to work hand-in-hand with Call of Duty®: Ghosts and provides several personalized features during and beyond your play sessions. – Battle for territory against multiple Clans with locations on the Call of Duty® Clan Wars map tied directly to Call of Duty®: Ghosts multiplayer game modes. Earn exclusive in-game bonuses by dominating your opponents, including additional soldier customization options and bonus multiplayer XP. 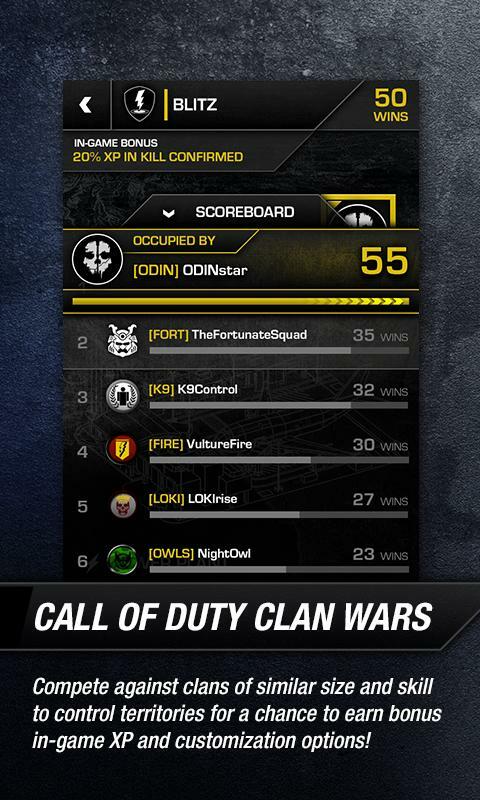 Each Clan War takes place over a set period of time, giving you multiple opportunities for your Clan to win. – Join, create and manage a Call of Duty: Ghosts Clan from the app. 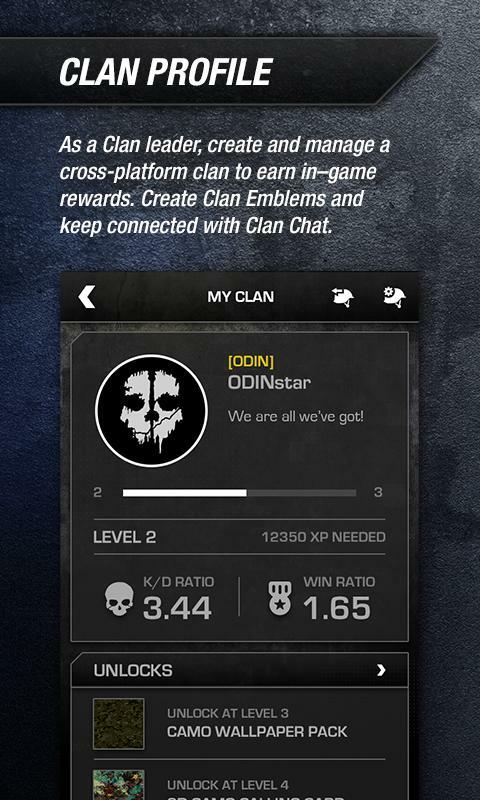 Communicate with Clan Members via the app’s Clan Chat feature to coordinate playtimes and gameplay strategies. The Call of Duty® app also includes a robust Clan Emblem Editor, so Clan Leaders can create and customize their emblem. – Stay up to date with all the latest Call of Duty® news and events, and check your career stats, and use the app’s Rally Up feature to notify friends that you’re ready to play. 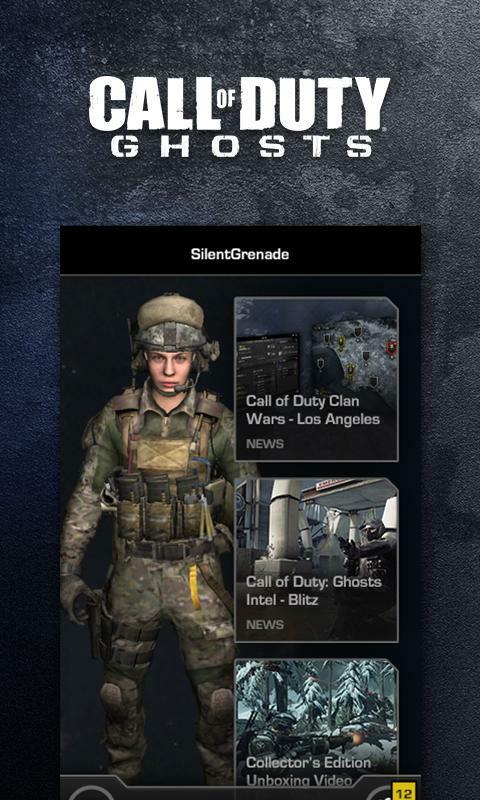 With its emphasis on deep game integration, Clan participation, second screen functionality and more, the Call of Duty® app truly adds another dimension to your Call of Duty®: Ghosts multiplayer experience. como empiezo a jugar??? start a play?? wow, this so awesome! I can link & play it on my SKYPAD now!! !